A forklift seat is more than just something the forklift operator sits on. It also is an important part of keeping the forklift safe and minimizes operator injuries. What follows are frequently asked questions concerning forklift seats. Q: What is a bolt pattern? A: The bolt pattern of a forklift replacement seat refers to configuration of the bolts that attach the replacement seat to the forklift (For example 11“ X 11” X 13-3/8th” or 8” X 11-1/2”, and so on). It’s important that you purchase a forklift replacement seat with the same bolt pattern as the vehicle you plan to attach it to so that it can be properly attached. If the bolt patterns are not the same, you may not be able to properly attach the replacement seat to the vehicle – at least not without an adaptor plate. While some bolt patterns are more common than others, there is no universal bolt pattern that can be used for every forklift. In addition, not all bolt patterns are the same, even within the same brand of forklifts. For example, some models may have different bolt patterns than other models within the same brand. That’s why it’s very important to know the bolt pattern of your forklift before searching for a replacement seat. Q: How can I tell the bolt pattern of my forklift seat? A: There are essentially two ways to determine the bolt pattern of your forklift. The first is to measure then length and width of the bolts on the existing seat on the forklift. The second, and far easier way, is to consult the owner’s manual for your vehicle. The dimensions of the bolt pattern should be listed under the category “Forklift Seat”. In some cases, the bolt pattern dimensions may be listed on the bottom of the seat itself, either on a metal plate or on a manufacturer’s sticker. Q: To be sure I have the right forklift replacement seat selected, how do I measure in order to find the bolt pattern? 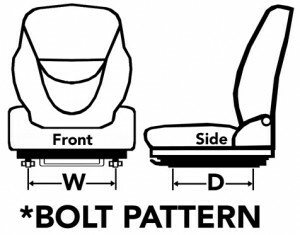 A: To find the bolt pattern, measure the distance between the bolt hole on the left of the seat to the bolt hole directly across on the right of the seat, center to center of the hole, for the width (“W”). To find the depth measurement (“D”), measure from the bolt hole on either side of the front to the bolt hole on the same side in the back of the seat, center to center of the holes. For example, on ForkliftAccessories.com the measurement is shown on each replacement seats product page (example) *Bolt Pattern: 11″W x 9.84″D. Please be aware some seats have multiple widths (side to side) bolt holes which are indicated as multiple widths (center to center). On ForkliftAccessories.com the bolt patterns listed defines how the bolt holes are set. When bolt pattern measurements are listed as this for example; Bolt Pattern: 6.38″W x 11.5D” / 8″W x 11.5″D / 11.25″W x 11.5″D / 11.5″W x 11.5″D the width (or side to side) has multiple fixed mounting holes. When bolt pattern measurements are listed as this for example; Bolt Pattern: 3.75”W – 11.25”W x 11”D, the seat can have multiple mountings so the shortest measurement to the widest measurement can be anywhere from the shortest measurement to longest measurement listed. When bolt pattern measurements are listed as this for example; Bolt Pattern: 3.75”W or 11.25”W x 11”D, the width (or side to side) has two mounting hole settings. *Some seats can have a combination of the aforementioned types of bolt patterns. Q: Does the Occupational Safety & Health Administration have specific rules requiring forklifts to have seatbelts? A: Yes. According to OSHA rules, employers are required to protect employees from “serious and recognized hazards.” So all powered industrial trucks manufactured after 1992 are required to have seat belts or another type of restraint specifically to reduce the risk of being crushed or “mousetrapped” in the event that the forklift overturns. Q: Is it required for new forklift trucks to have seat belts? Q: If a seat purchased by an employer is not equipped with a seatbelt, is the employer required to retrofit the seat to include one? A: If a forklift does not have a seatbelt, OSHA can mandate installation of one. This requires the employer to be notified by the forklift manufacturer that mousetrapping hazards exists and that a retrofitting program has been initiated. If the employer does not take advantage of the retrofitting program, once it knows it exists, OSHA can cite the company for failure to comply. Q: Are forklift drivers required to wear seatbelts? A: OSHA requires that operators use seatbelts when they are furnished. Employers are responsible for ensuring that forklift operators are wearing their seat belts. If the operator does not use seatbelts, the employer could be cited for failure to comply with OSHA standards under the Occupation Safety and Health Act, which require companies to protect employees from recognized hazards. Replacing worn forklift seats adds to safety. Q: Is there a penalty for employers if a forklift operator does not wear the seatbelt? A: An OSHA compliance officer who observes a forklift operator not using a seat belt can issue a citation to the employer for failing to comply with OSHA regulations. Before issuing the citation, the compliance officer is required to check with the manufacturer of the forklift to make sure that the machine either was manufactured with a seat belt or that a retrofit kit had been made available to the employer. If the forklift has a seatbelt, or if there is a retrofit kit available, the officer will issue a citation. The employer also may have to pay a penalty to OSHA. The amount of the penalty depends on the degree of danger and whether the employer had previous citations. Q: Does OSHA require employers to replace worn forklift seats with a replacement seat? A: Although OSHA does not have specific regulations concerning this. However, employers should be concerned about the well-being of their employees and should consider the replacement of a worn seat. The Majority of the work performed by a forklift operator requires him to sit for extended periods of time. There are great benefits to ensure that this time is as comfortable and safe as possible. Replacing an old forklift seat with an ergonomically friendly seat is just one of the many ways to accomplish this. If your workplace has a forklift with a worn or cheaply made seat, consider this a potential safety and productivity issue. Forklift seating that does not provide proper support for the operator can have serious consequences. The nature of the job for a forklift operator is repetitive. When driving a forklift, operators find themselves in awkward posture positions for long periods of time. In addition, constant vibrations and shock experienced by the operator can result in uncomfortable working conditions. Functioning under these circumstances over time can produce varying levels of physical damage from strain, severe pain, to even an inability to work, which is a serious liability for all employers to consider. · Leg, head, shoulder, and neck protection in case of tip-over. · Swiveling base for increased visibility and reduced needless twisting. · Armrests to prevent fatigue. · Weighted suspension that guarantees comfort for all operators. Q: Are forklift seats universal? A: Unfortunately, forklift seats are not universal. In other words, you can’t simply take any forklift replacement seat and install it on any forklift, regardless of its brand, model or size. Forklift replacement seats attach to the vehicle by means of a series of bolts that can be found on the bottom of the forklift seat. These bolts are arrayed in a pattern known as the “bolt pattern”. The bolt pattern of the forklift replacement seat must be the same as the bolt pattern on the forklift itself otherwise the seat won’t be able to be attached to the vehicle – at least not without an adaptor plate. Frequently, the forklift seats among the same product lines and, in some instance, brands, are interchangeable. For example, the forklift seat in a Toyota 7-series can usually be put into another vehicle in that particular product line. In other cases, different models may require different types of replacement seats. That’s why it’s important to know the bolt pattern of the forklift seat you are replacing before purchasing a replacement seat. If the replacement seat has a bolt pattern that isn’t consistent with the vehicle onto which you plan to install the seat, it may not fit. Q: What are the benefits of foldable forklift seats? A: Forklift replacement seats come in two basic types: Stationary seats and foldable seats. Once stationary replacement forklift seats are installed on the vehicle, the back of the seat cannot be moved forward or backward. The angle between the seat and the seat back remains stationary, hence the name. Foldable replacement forklift seats, on the other hand, can be folded forward up left upright. On some foldable seats, the operator can adjust the angle of the seat for maximum personal comfort and stability. Q: What’s the difference between OEM, universal and aftermarket forklift replacement seats? A: OEM is an abbreviation of the term “original equipment manufacturer”. So an OEM forklift replacement seat is one that is officially approved by the company that built the forklift in the first place. For example, the seats that were installed in Case forklift when it was built are OEM seats (even if Case bought them from another company prior to installing them in their vehicle). You can buy OEM forklift replacement seats, which would be the same seats as those that were originally installed on the vehicle when it was built at the factory. Universal forklift seats are designed to fit into a wide variety of different forklifts, regardless of their brands, models or sizes. Not all forklift seats are universal, however (see “Are forklift seats universal?”). Aftermarket forklift seats are those that originally were used in other vehicles. In other words, they are used forklift seats. But that doesn’t necessarily mean they are of lesser value. Some aftermarket forklift seats have been rebuilt, reupholstered, or otherwise refurbished so that they are in the same, or even better, shape than they were when they were originally manufactured. In other cases, aftermarket seats that have been used in other vehicles still have many more years of useable life while providing the buyer with a greater value than OEM or newly-made universal forklift seats. Q: Am I limited to which kind of forklift replacement seats I can get by my brand of forklift? A: Yes. Forklift seats are not universally interchangeable. You generally are limited to forklift replacement seats that have the same bolt pattern as your existing forklift seat. If you purchase a forklift replacement seat with a different bolt pattern than your existing seat, you may not be able to install it on your vehicle. There are adaptor plates that can be purchased that can fit a forklift replacement seat onto a forklift with a different bolt pattern. But keep in mind that these will add weight to your vehicle, increase the cost of the seat replacement, and require additional time and effort for installation. Plus, these may not provide as good a fit a forklift replacement seat that has been specifically designed for use in your vehicle. In theory, you could drill new holes in either your forklift replacement seat or the forklift itself. But there’s a good possibility that this could void the warranty of your forklift replacement seat, your forklift, or both. Plus, if an accident or injury should result as a result of this unauthorized modification, you could be liable. Generally, the best approach is to purchase a forklift replacement seat with the same bolt pattern as your existing forklift seat. Q: What makes some forklift seats more ergonomic than others? A: The science of ergonomics is a fast-growing field that combines advancements in medicine with improvements in industrial engineering. In a relatively short amount of time, developments in ergonomics have made forklift seats both more comfortable and supportive. This allows operators to spend more time behind the wheel of their vehicles, enhancing productivity while minimizing the risk of injury and soreness. Forklift replacement seats that are ergonomically designed tend to adhere more to the natural curve of the spine, providing support for the lower lumbar region while at the same time absorbing more of the natural vibrations and impact that come with operating a forklift in an industrial setting. Generally, ergonomic-friendly forklift replacement seats may cost a little more, but their benefits to productivity and reduced risk often outweigh the additional expense. Q: How can I tell when my forklift seat needs to be replaced? A: Forklift seats should be inspected regularly for obvious signs of wear and damage. These can include broken or exposed springs, depressions in the seat base or back support pad that remain even after the operator has exited the vehicle, and malfunctions in the seats mechanics such as the inability to easily adjust the seat into a comfortable position. But perhaps the easiest way to tell if your forklift seat needs to be replaced is the way it feels when you sit in it. If the seat is worn, broken, or simply reaching the end of its useful life, you can tell by how your body feels when sitting in it. If your forklift seat is uncomfortable or causes you to feel soreness or pain after operating it for only a short period of time, it could be time to replace it. Q: Do all forklift seats come with seatbelts? A: Many forklift seats, but not all, come with seatbelts. The US Occupational Safety and Health Administration requires that any powered industrial vehicle built after 1992 have working seat belts. Forklift replacement seats that don’t include seat belts need to either use the vehicle’s existing seat belts, or be retrofitted with seat belts in order to be in compliance with federal workplace safety regulations. Q: Do I need a shoulder belt for my forklift seat? A: Shoulder belts are standard equipment on cars and trucks, but there aren’t commonly used with forklifts. While shoulder belts are sometimes offered on forklifts to provide an additional level of safety and security to the operator in the event of a tip-over or collision accident, but there are not mandated by federal safety regulations, the way seat belts are. Q: Do all forklift replacement seats come with arm rests? A: No, not all forklift replacement seats come with arm rests. Arm rests can provide additional comfort and ergonomics to the operator by providing a place for elbows and forearms to rest while operating the vehicle. But armrests are not standard equipment on all forklift replacement seats. Q: What are the benefits of retractable arm rests? A: Retractable armrests on forklift replacement seats can be folded up and out of the way or folded down, depending on the preference and needs of the operator. For example, retractable arm rests that are in the up position often make it easier to get in or out of the seat before and after operating the vehicle. But when they are in the down position, retractable arm rests provide additional comfort and ergonomics to the operator by offering a place for elbows and forearms to rest while operating the vehicle. In instances in which the operator is too large to comfortably fit into the forklift replacement seat with the retractable arm rests in the down position, moving one or both arms into the up position can enhance the comfort of the operator. Q: What’s the difference between permanent arm rests and retractable arm rests? A: There are actually three options when it comes to arm rests for forklift replacement seats: 1.) Permanent arm rests; 2.) Retractable armrests; and 3.) No arm rests. Some forklift replacement seats don’t have any arm rests. Instead, the operator has no place to rest their forearms or elbows while operating the vehicle. Forklift replacement seats with no arm rests can be less comfortable for operators, especially if the vehicle is to be used for longer periods of time. Retractable armrests offer the convenience of being able folded up and out of the way or folded down, depending on the preference and needs of the operator. For example, retractable arm rests that are in the up position often make it easier to get in or out of the seat before and after operating the vehicle. Permanent arm rests cannot be moved up or down. Instead, they remain in their existing position permanently. While they can enhance the comfort and productivity of the operator, they don’t offer the additional convenience of retractable arms. Q: What are the four essential parts of a forklift replacement seat? A: The four essential parts of a forklift replacement seat are: 1.) The seat base; 2.) The seat back; 3.) The seat bracket; and 4.) The seat belt. The seat base is the bottom of the forklift replacement seat on which the operator sits. Generally, seat bases contain springs and padding that absorb the impact of vibrations that occur while driving the forklift, enhancing the comfort and safety of the operator. The seat back is the padding against which the operator’s back rests during the vehicle’s operation. Like the seat base, the seat back typically contains springs and padding to make the driver more comfortable. Some forklift replacement seat backs are ergonomically designed to follow the curvature of the driver’s spine in order to provide additional comfort and to help protect the operator from injury or soreness, especially when driving the forklift for long periods of time. The seat bracket is what connects the forklift replacement seat to the vehicle itself. Some, but not all, replacement forklift seat brackets include adjustable slides that can be used to move the seat forward or backward to provide a more comfortable fit for operators, depending on their size. A seat belt is included with many forklift replacement seats. Generally, it is a lap belt only and does not include the type of shoulder belt that is standard equipment in cars and trucks. The seat belt on a forklift replacement seat is designed to hold the operator safely in place in the event or a tip-over accident, collision, or other unusual event. A fifth forklift replacement seat part is the arm rest. But because these are not included with all forklift seats, they are not considered to be essential parts. Q: Are all forklift replacement seats adjustable? A: Many forklift replacement seats are adjustable, but some are what are known as “static seats”, which means they can’t be moved. Forklift seats that are adjustable allow the operator to move the seat forward or backward in order to maximize comfort. The more comfortable the operator, the longer and more effectively he or she will be able to operate the vehicle safely. Q: Besides test-driving it, how can I tell which forklift seat is going to be the most comfortable for me? A: When you are ordering a forklift replacement seat from a catalogue or website, it’s often difficult to know how that seat will feel when you are using it in real life situations. But there are still ways you can ensure that the replacement seat you order provides maximum comfort, security, and effectiveness. The first way is to order a replacement seat that is the same as a forklift seat that you already have used, are familiar with, and like. For example, if you are happy with your current forklift seat but it has become old, worn, or broken, you can simply re-order that exact same seat. Besides getting a seat you already know you like, you get the additional benefit of getting a seat that is assured to fit on your existing vehicle’s bolt pattern. Another way is to go by word of mouth. Ask your co-workers or trusted associates which forklift replacement seats they prefer. Odds are, if they have found a seat they know and like, you will like it as well. In the digital age, word of mouth often translates into paying attention to user ratings and reading user reviews on the websites that offer forklift replacement seats. If a replacement seat gets high ratings and rave reviews from other users, that’s probably a sign that you will like it as well. Finally, if you frequently operate many different types of forklifts, start paying attention to how the seats feel when you are in them. When you find a seat that is particularly comfortable, jot down the seat’s make and model number and keep this information somewhere safe for when it’s time for you to order forklift replacement seats for your vehicles. Once you find a type of seat you like, you can stick with that forklift replacement seat moving forward. Q: Many forklift replacement seats claim to provide “lumbar support.” But what exactly does that mean? A: Forklift replacement seats with lumbar support are specially engineered to provide three additional support systems than standard seats. First, lumbar support in the seat’s back and base support the pelvis and provides balance for the spinal column. Second, lumbar support offers additional support for each vertebral disk in the lumbar, or lower back, region. This provides relief for the spinal column and helps relax the back muscles. Third, lumbar support braces the upper body, which helps relieve neck tension and offers additional relieve to the vertebral disks. Q: Are there heated forklift seats? A: While not yet widely available in forklifts the way they are in many luxury cars and trucks, there are some companies that offer heated forklift seats for use in cold-weather climates, as well as refrigerated and freezer operations. For example, Crown offers a heated seat on some of its SR 5000 Series moving mast reach trucks for us in cold storage environments. Another option is to use seat heaters that can provide heat with any forklift seat. Seat heaters have heating coils that warm up when plugged into a12 volt power source.